This post is just what it is – The investigative bug has caught up with me and given that there are (i) more studies on impact of diet on eczema, and (ii) more people (experts or not) claiming that their diet is ‘proven’, I’m setting out in this post to POUR THROUGH ALL THE ECZEMA and DIET studies I can find and make sense of it for you here; Let’s see my investigation report! In a trial conducted with 952 participants, there was no evidence of protective effect of maternal dietary antigen avoidance during pregnancy on the incidence of atopic eczema during the first 18 months of life. Another two trials that had 523 participants similarly did not see benefit of avoidance of antigen during pregnancy for babies up till 18 months nor on their skin prick test results up to 7 year old. In a review article of 21 trials from 1997 to 2007, there was evidence that probiotics prevented the onset of pediatric atopic dermatitis. In another article covering up to 2011, there was evidence of probiotics for the prevention of atopic dermatitis in infants, and this benefit was seen both for mother and child, and whether taken during pregnancy or early life of child. In a consensus document, the conclusion from reviewing 52 studies from 1998 to 2006 was that early introduction of solids can increase food allergy. The recommendation was to introduce at 6 months, dairy products 12 months, hen’s egg 24 months, and peanut, tree nuts, fish, and seafood at least 36 months for those with higher risk of food allergy. An update on a study on early introduction of eggs done in August 2015 showed that the elevated immune responses to egg were established prior to egg ingestion at 4 months and were not affected by whether eggs were introduced early. In a review article of 12 studies up to 2006, there was (i) no evidence to support hydrolyzed formula to replace exclusive breastfeeding, and (2) limited evidence that supported hydrolyzed formula for high risk infants who could not be 100% breastfed. One article that provided such evidence concluded that partially hydrolyzed formula is more effective than standard formula for high risk infants. In a trial of close to 14,000 mothers, there was no evidence of protective effect of prolonged and exclusive breast feeding on asthma or allergy. In a review article of 3 studies up to 2006, there was no evidence of reduction in allergies for children fed with soy formula. 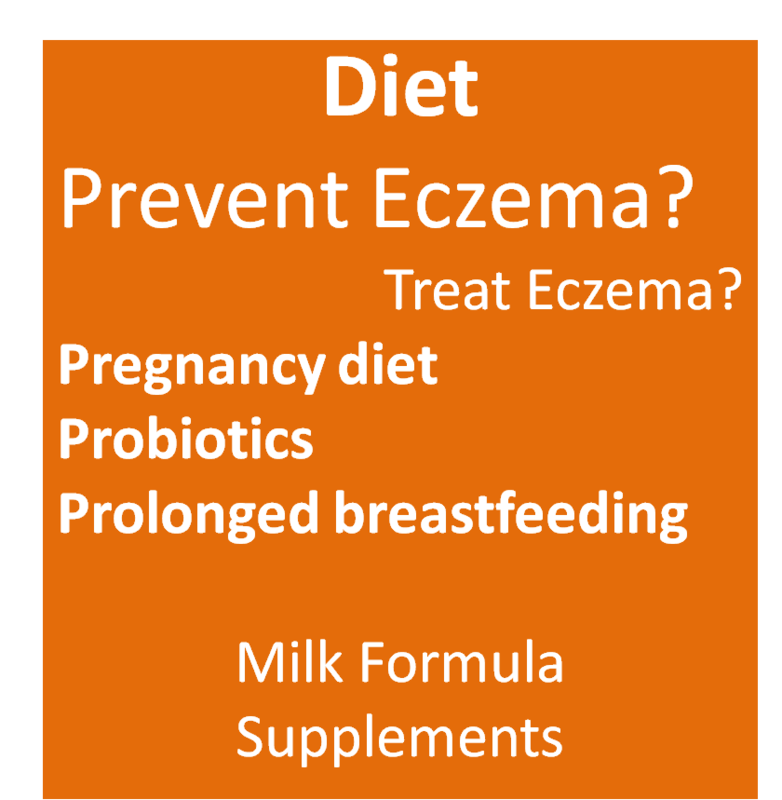 In a review article covering 13 studies up to 2012, there was limited evidence of prebiotics added to infant formula can prevent eczema, but the authors cautioned that further research is needed prebiotics can be routinely prescribed. In two review articles (one of 12 studies up to 2007, the other up to 2008), there was insufficient evidence to recommend adding probiotics to infant feed. In another review article covering 10 studies up to 2009, there was no evidence for reduced risk of allergic sensitization or a favourable immunological profile. In a review article, the conclusion from reviewing 9 studies (up to 2006) was that there was (1) no evidence of benefit to an egg and milk free diet, (2) no evidence of benefit to an elemental or few-foods diet, (3) some benefit to egg-free diet for infants with positive IgE to eggs, with improved eczema. In a review article covering 11 studies up to 2011, there was no evidence of benefits of supplements in the treatment of eczema. The background of this study was that many patients turned to supplement to avoid steroid treatment, fearing long-term effects. However, there was no evidence for supplements like fish oil, olive oil, corn oil placebo, zinc sulphate, selenium, selenium plus vitamin E, vitamin D, pyridoxine, sea buckthorn seed oil, sea buckthorn pulp oil, hempseed oil, sunflower oil (linoleic acid) and DHA. 1st, I’ve made it a point to look at the studies themselves, rather than articles that refer to studies (so that I minimize the lost in translation effect). I also urge parents who are taking the leap to try a specific diet to ask your doctor and read up on studies, instead of relying on fad posts or personal testimonies. 2nd, I must make it clear that I’m no expert in reading studies, the review articles mentioned were all written by medical professionals. Should any medical professional coming across this post and see any misinterpretation, do point it out to the rest of me. Great recap. I found a few more links that may be helpful.